The story of Hux-Flux started back in 1998 when Dennis Tapper started making music after some life changing visits to the legendary kilsbergen trance partys outside Örebro, Sweden, where he also lived at the time. 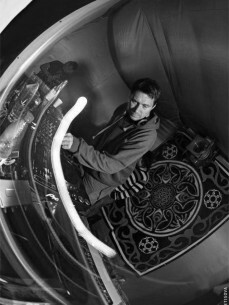 After a few releases on his own, including the hit "Time slices", Dennis started to work with Jonas Petterson (a.k.a Tranan) and they produced the now classic album "Cryptic Crunch" together. After returning from a half year trip to Asia, Dennis relocated to Stockholm and started producing with his long time friend Henric Fietz. Their work resulted in some killer classics, like "Idiot" and "Bring your own BIOS", as well as the album "Division by Zero". Dennis also produced tracks under the name Hux-Flux on his own during this time, some examples of this work are the dancefloor hits "Reflux" and "Equivalent Equations". .
An important ingredient in todays Hux-Flux sound is the fact that Dennis, after being educated in DSP mathematics at the university, writes his own audio processing plugins. Some of them will be commercially available in the future. . These days Dennis also produces on a psydub project called "Illuminus" alongside his friend Magnus Holte, while mastering on a more darker, Psy-ish project called "Tryptamind", where he combines forces with his old Swede mates Mathias 'Ibojima' Andersson and Jonas 'Tranan' Pettersson.